Higher fines for HOV violators? The King/Snohomish Master Builders argue for more density. See also: Oregon. Seattle DOT is planning to allow right-on-red from the tunnel exit through the Dexter bike lane. Seems problematic? Why can’t Seattle build affordable housing on land it already owns? The linked KIRO dewiring story as posted and broadcast came out about two years ago and I don’t see why the station added a 2019 date or update to it. It’s the same broadcast from back then. The ST PTC project has nothing to do with Amtrak returning to the Point Defiance line. Since Sounder utilizes BNSF’s PTC system, it has been using it for several months. There was some locomotives and can cars that were not equipped that are now, completing the project. Amtrak’s return to the Point Defiance line will solely depend on the NTSB recommendations which may call for removing the 30mph curve. Brian, anything we the public can do to turn the “may call for” into a “definitely” on the end of that evil curve? Seems to me the railroad and everybody connected with that piece of track owe at least that much to the three railroaders it killed year before last. That and a prominent memorial as part of the replacement. Mark, rebuilding that curve would be at least $40 million the State is reluctant to devote to the project. PTC will ensure that no train can enter that curve at higher than 30 miles per hour. Remember that today the trains slow to 30 or less to cross that old drawbridge in Steilacoom. The curve is no more a delay than the drawbridge is, and the rest of the route is far faster. No land for housing … Jackson Park Golf Club, West Seattle Golf Club, Jefferson Park Golf Club, Interbay Golf … All City of Seattle owned. And how many people know that Jackson Park not only has a full 18 hole course, but an additional 9 hole course, as well? You could take a third of the land for housing, and still have an 18 hole course! “But Sam, cities can’t turn public golf courses into housing!” The City of Redmond used to have a public course where Redmond Town Center and all those new apartment buildings on Cleveland St are. Dare I mention that three of the four courses are within TOD distance of future Link light rail stations? A public course just means you don’t have to be a member to reserve a tee time. The course in Redmond was privately owned. The courses you mention in Seattle are publicly owned parks. Yes, I guess Seattle could turn Gas Works Park into low income housing but I don’t see that being popular. As areas densify it’s more important than ever to preserve open space. Bernie, you are 100% incorrect. It was a public course. Sam, read what I wrote. A public course does not mean it’s on publicly owned land. It means the course is open to the public.as opposed to a course which is for members only. Comprende? Bernie, just because you write something in some blog’s comment section doesn’t make it true. You said the Redmond course was privately owned. Citation required. Where’s your proof? The apartments are under construction. No, they’re not high rises or anything, but then again, neither are the apartments at Market and 15th. Seattle needs more parks not less. Removing parks space in Seattle would be a colossal mistake which would hurt generations to come. It would be a big, big mistake to get rid of golf courses to make into housing. Seattle is not creating more recreational park space. Preserve our golf courses. Converting golf course space into housing doesn’t mean “removing parks space in Seattle.” By law, any taking of parks land has to be replaced. So the question really is whether we want money to provide more green spaces in the dense areas we’re building that are lacking it, free up land with tremendous TOD and upzoning potential, and remove parks land that is only accessible if you’re playing a game that is historically one played by privileged, White people and which is currently not making enough revenue to sustain the THREE publicly-owned golf courses in the City. The gold in this possum-living-in-a-bus story is the quote from the agency that funded the $1.3 million dollar Proterra bus for the City of Burbank. The bus was never put into service and has just been gathering dust for the last ten years. It’s called an “experimental bus” because it was an experiment. They found out that the “promising” lithium-titanate batteries didn’t deliver the reliability they needed. How hard is that to understand? Obviously, it’s too hard for trolls. I thought you RWNJ’s were all about technological advancement “saving” us from Climate Change. Guess, what, technological advancement isn’t magic. For every successful idea that creates a billion dollar company there are at least 10 abject failures. Edison put the number at 100, but there’s more engineering match available today so the failure rate has fallen. In any case, this was one of the failures, and hallelujah they only built one. Could be a matter of context, Sam. We’d have to know where all ELSE that possum had been sleeping. And, over the years, leaving arrivals of little possumettes. By the financial calculation, if the little creature was rooming in Agency headquarters, her quarters could’ve been assessed at a lot more money. Those animals go back quite a long way, so good chance they were found sleeping in conveyances that didn’t yet have wheels. NASA’s first discovery will be interesting- maybe a poor little fugitive fleeing the American southland for the legendary World Without Sweet Potatoes. Though if his crew thought to bring some aboard with them….who said the Universe was fair? What was the point of the Kiro Trolley link? I will have to read it again. Saw no new info. The only update I saw was a new date. More superb metro management. That department is ripe for a serious housecleaning starting with procurement. I think it’s disgraceful this site has turned so heavily toward rooting for the tunnel to fail. Next up… The debacle when busses are removed from the dstt. The removal of buses from the DSTT has nothing to do with Metro’s management. It has to do with the City’s willingness to allow the bus ingress/egress at Convention Center to be destroyed for the expansion before Link reached Northgate. It wasn’t Metro’s choice to make. It wasn’t the city’s choice either. King County owns the tunnel. Erm, King County also owns Metro. Well, thanks to The Stranger for info about the lane space on the new Waterfront. Should be able to double-track the streetcar when time comes to put it back. But no rush about the grooved rail. Two-way fully reserved transit way will work just fine with new generation of electric buses both full-battery and battery-assist which will let them drop poles to cross the BN track at Broad- on their way to and from Seattle Center. Projects are always designed with 12′ lane spacing. That’s the standard so that later on it can be changed to 10′ lanes and shoulders used to create an additional lane. Surely you don’t thing any highway project would be designed without the option to add a lane in the future; That would be naive. I’ve hardly ever experienced bus de-wirings in recent years. Maybe one or two in the past year. In the 80s and 90s trolleybuses fell off the wires all the time, like a few times a month. Too long past my own trolleydriving days to have kept track, but whole mechanism has changed completely in recent years. Thankfully, I’m told. Prime directive still same. Get pole and everything on it below wire level fast as possible. Just done more gently now. Can somebody give us first hand update? Worst (and it can be really bad) case is when the motion of the bus can use a dewired pole to rip down a whole intersection full of metal- several tons, right?- all fully charged. So in my day, first line of defense, a powerful spring very tightly wound, could wrench your arm out of its socket it you made the wrong move while holding the rope. Another hazard I need update on: is there still a tradition of retirees claiming that general hazards like that were better than the machinery that spoils so many young operators now? Because you 60 year olds got no IDEA how good you got things! It depends on what that means. Maintenance is not very objectionable, and safety improvements might be OK. What’s objectionable is new highways or significant widenings. It’s not so easy here, Bernie. As you say “toll roads are common, and always have been, on the east coast”. In fact, many — not all, but many — of the primary Interstate Highways back there are on grandfathered toll roads. For instance, I-95 — I-95, the easternmost primary Interstate — has never been completed north of Trenton, New Jersey, because the State didn’t want competition to its Turnpike piggy-bank. For decades it was a triplet of dotted lines parallel to US 1 between what became I-295 on the north edge of Trenton and what is now I-287 west of Perth Amboy in the Rand-McNalley Road Atlas. Finally the State just moved the designation to the Turnpike to make what was obviously the plan all along official. But out here the Interstates were all built with 90/10 Federal Matching, and the states are therefore forbidden to toll them. Sure, that’s a law, but the Red Staters in the Senate would block any change to the Interstate enabling legislation to allow states to toll existing roadways beyond the existing fifteen “test” projects. Well, we manged to get tolls on I-405 which are slated to extend all the way to the HOT lanes on 167 once the Direct Connector project is complete. There was talk of tolls on I-90 to manage traffic flow after SR-520 tolling went back into effect. Turns out that diversion wasn’t as big of a problem as people thought it would be. The bottom line is that I think there would be more of a stomach in the Senate to approve tolling than to increase the federal gas tax to the level that’s going to be needed to fund highway repairs and maintenance as cars are steadily using less and less gas per mile traveled. And if gas prices/taxes take a big bump up then we’ll see even more emphasis on fuel economy. Maybe even threatening the F-150’s dominance as the vehicle of choice. That’s because the I-405 project “added capacity” in the form of a pair of lanes and the extension south to SR 167 will also. If a State replaces a “facility” (e.g. “bridge” in practical terms) that entire facility can be tolled. Or, if it add lanes, they can be tolled. But existing freeways not “grandfathered” as tollways cannot be tolled unless the State which owns them has a Value Pricing Project waiver. I certainly agree with your analysis and would support expanded tolling, both for congestion relief and as a revenue source for highway maintenance. Under current law, though, those are limited to the 15 waiver holders. Washington is one of the 15 waiver holders, but that doesn’t give it the right to impose tolls widely. It has one “project” it can build, and it may be that the conversion of HOV to HOT on I-405 consumed that waiver. I don’t know, but it certainly doesn’t seem to be considered in the Legislature as is being done in Oregon. Of course, the Oregon Legislature has a super-majority of Democrats and is therefore freer to make such a choice. Well said, Mike. There is no good reason for any new roadways in the State outside Central Puget Sound (the 167 and 509 projects) and maybe paving some county roads out east. But there are real opportunities for safety improvements and some through highways (e.g. SR522) still have bottlenecks that can be eased without greatly inducing demand. But why would maintenance be objectionable in any way? You said “not very” but it’s “Infrastructure 101” that it needs to be maintained to a state of good or better repair. Personally, I think that almost all of Washington’s state highways other than I-5 and I-90 have excellent pavement. The freeways are worn out in places but the 2014 bill seems to be fixing their surfaces in a timely manner. The elephant in the room no one’s talking about is the elevated section of I-5 through Seattle. There’s no way to shoo-fly an elevated structure and the structure is wearing out. It’s not that much younger than the Viaduct and carries much heavier loads. That’s completely misleading. The viaduct isn’t being replaced by eight more lanes. It’s being replaced by eight minus the current width of Alaskan Way, which I think is four lanes. And the wide part is only south of Columbia Street, which is not the touristy core but transitions quickly to industrial. And three of the lanes are two transit lanes and one ferry-queuing lane, so it’s not like they’re all GP lanes. North of Columbia will be a normal four-lane road like the existing Alaskan Way. That’s what will be in front of Pike Place. The article in The Stranger is kind of a joke all around. I can only assume the author has been asleep for the past 5 years or so. I keep hearing the “the DBT is only 2 lanes in each direction and the viaduct was 3 lanes in each direction” argument. The throughput of Hwy 99 was always restricted by the Battery Street tunnel. (2 lanes in each direction). I’m glad the viaduct is disappearing, but not happy how much waterfront is being given to auto traffic needs. Any rebuild of the viaduct to modern earthquake and noise standards would have eliminated the ‘amenities’ that current drivers anyway. A single level viaduct would have worse, since it would have had to be wider, so the entire Alaskan Way would be underneath it. Elevated highways are also very noisy. The street, for all its excessive width, will be significantly quieter that the viaduct. The problem was the assumption that we need so many lanes to support people driving downtown. I agree that the net loss to thru capacity is essentially the two Battery St tunnel lanes in each direction. Maybe one more if you account for the Elliott & Western ramps. My quick exploration of WSDOT traffic counts suggested that the viaduct was used far more for access to downtown than for thru traffic. Obviously the DBT replaces the thru capacity, though the past several weeks have shown how insignificant that traffic might be. I predict things will get real interesting when the tunnel gets told and we find out how few of the thru drivers are willing to pay to bypass downtown. Not significantly wider, 4 lanes instead of 3. With modern building techniques the column structure would be far less intrusive. If you didn’t return the parking (major battle) the whole thing could become a linear park with a covered bikeway. There’s also ways to minimize the roadway with sound barriers and quite pavement. The greatest noise generator is speed; so limit it 30mph. I would argue that the visual, noise and air quality impacts are going to be far worse with the surface street. The main reason this wasn’t ever seriously considered was because the viaduct would have to been torn down before construction on the new road started. And that would simply be too much of an inconvenience. As for not needing the lanes, well… if people aren’t willing to pay the toll for that portion of the funding for which was agreed upon then yes; it wasn’t needed. Alaskan Way could actually shrink in the future. I believe they’re building it so that if something isn’t needed in the future, they can convert one or two lanes to park use. It must be the transit lanes. 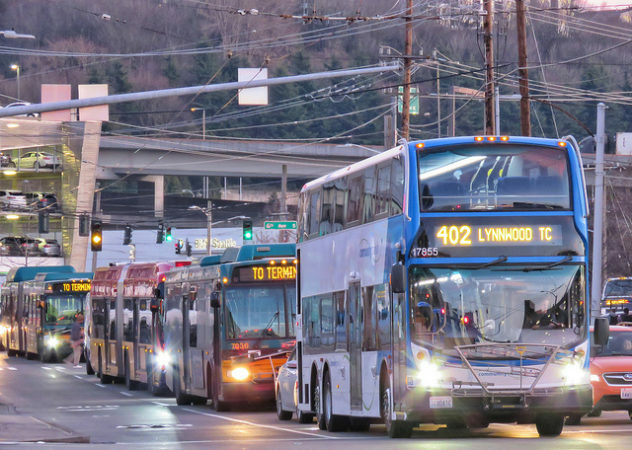 When West Seattle Link is built, there may be no more buses to drive in the lanes. Actually, it’s two ferry queuing lanes, one for each route. Mike, I wonder if it’s useful to think of Colman Dock as the point where a waterborne section of our state highway system comes joins its land-side counterpart, whose activity mostly orients south from the landing. Leaving the Waterfront north of Columbia a lot more amenable to pedestrians, bikes, and public transit. As its narrow width and tight turn across the BN tracks at Broad limits its use as a through motor corridor. I can see Pier 70, the Sculpture Garden, and the Victoria Clipper terminal become a perfect activity hub to terminate renewed Waterfront line haul transit-way. Steel or rubber wheels, overhead wire or battery. ‘Nother lost piece of mental track though…. do I really want to know who, by name or agency, will be In Charge of the Waterfront? Because Chris….worse possibility for Stranger’s contributor….what was their age-range in 2005 when the Streetcar died? Either end of the age scale, people deserve a little pity. Because even this far from Transylvania, there really are zings dot Mankind vill just have to figure out how to deal mitt all over again. The boulevard will turn away from the waterfront somewhere north of Pike Place, the way the Viaduct does; I think the boulevard will connect to Elliott/Western. At that point Alaskan Way will separate from the boulevard and continue to Pier 70 a s a quiet two-lane road. That’s the third phase; the waterfront team hasn’t designed it yet. There can be a discussion of what it might contain and whether the buildings around it should change somehow. Some kind of gathering place would be a good idea. The waterfront plan includes a local bus or minibus along the entire Alaskan Way, from Pioneer Square to Pier 70, with an optional extension to Seattle Center. The waterfront team disrecommended a streetcar, either vintage or modern, because it would take two lanes away from the limited park area. That’s going to be one steep hill. It’s not steep but it is a noticeable hill from the tunnel portal down to the flat part of the viaduct. However, the new roadway will have to climb from roughly twenty-five feet lower, the height of the roadway in the flat part. It’s also going to have to trash either the Pike Place Market Garage or some of those very nice apartments/condos between the BNSF tracks and Alaskan Way. That will be some hullabaloo! Sounds like some serious management issues at Twin Transit. The idea of forming a commission to figure out how to solve the missing middle problem is ridiculous. It isn’t hard to solve. Just reduce government restrictions on what can be built in single family neighborhoods, which will allow for more affordable for-sale housing options. If you want more for-rent housing options, then you are also going to have to reduce government regulations on small landlords. Hopefully that’s what the commission will recommend, at least the first part. The purpose of the commission is either (A) to amass some facts on the impacts that Durkan can use for ammunition so that she’s not a one-person resistance against the NIMBYs, or (B) a way to make it look like she’s doing something when she isn’t. Which way it is depends on what she does with the results, or reading her diary to find out now. Is Amazon paying for those tunnel billboards? That green line sure looks like Jeffy’s “smile”. It’s been “somewhat successful” in other cities such as London, Stockholm and Singapore. Funny that those cities actually have a transit system that allows other ways to travel. Seattle does not have that, not even close. And there is no legitimate argument that it does. There is absolutely no place in London that would take 4 times longer (in non-rush hour traffic) to take transit than to drive from point a to b. And the first ghing the article says is that there’s a way to have it fair for low income individuals! What about everyone else? People seem to think you must either be low income or wealthy. Low income are probably less vulnerable than this “middle class” who take the brunt of every ridiculous little whim this city can come up with. Equitable pricing would include bikers paying their fair share for the roads they are slowly allowed to take over….paid for by those who are required to drive or face astronomical sitting times on transit. Whooey! I was bad, bad, bad. I guess “cupcake” is an ad hominem now? Duly noted. Would a fair charge for bicycles’ impacts be 1/100 of the car fee or 1/1000? Also, we could reduce the space taken by roads significantly if half the drives switched to bicycles. That equitable pricing thing could work pretty well. With the lack of investment in bike lanes, most Seattle bicyclists would probably get a nice refund on their property tax bill. Several hundred dollars in incentives might get more people to bicycle. I bike and I also pay property taxes that go towards roads. New housing plan in San Francisco: build atop a bus facility. At some point the Metro and Link facilities in SoDo are going to be awfully tempting.